Yoga is the union with the ultimate, since aeons yoga is practised in India by the different section of people in the society. This practice is not only limited to sages or aesthetic, but the normal householder can also perform and teach it. This traditional practice has become so popular within masses that the United Nations has declared 21st of June also the day of Summer Solstice as the International Yoga day. 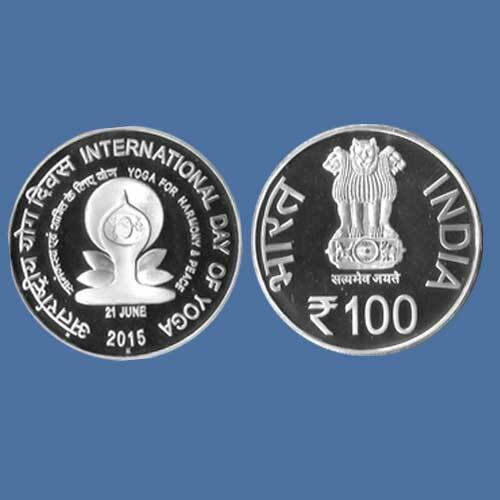 To commemorate this day Indian government has issued sets of 100 and 10 Rupees proof and Uncirculated (UNC) coins, further they have also issued 10 rupees circulated coins illustrating the symbol of yoga for harmony and peace. Yogic asanas or postures are also illustrated on the coins of Madhurai Nayaka, Shree Veera type coins feature Bhujapidasana and Vrikshasana. Yoga is not only about asanas that rejuvenate the physical body; it is also about the stability of mind and soul. Today this fourth International Yoga Day is celebrated by our Prime minister with at least 50,000 people in Dehradun. This day was also commemorated on stamps released in 2015 by the India Post.